Welcome to the Silkn Flash&Go HPL Hair Removal Device Giveaway! 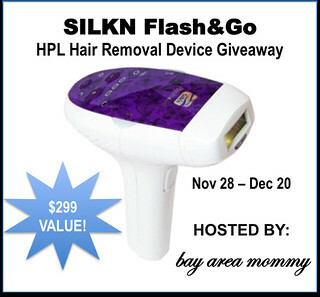 This blog has joined Bay Area Mommy in giving away a Silkn Flash&Go HPL Hair Removal Device to one lucky winner as part of her 2012 Holiday Gift Guide! This device works pretty much like laser but is safe for at-home use. However, it will not work on certain skin and hair colors. Check out the details and product FAQs at the Silkn website (scroll down to the area just below the “Add to Shopping Cart” button) to see if this device is for you. Regardless, you can still enter the giveaway if you know someone who could use and love it! The Silkn Flash&Go HPL Hair Removal Device Giveaway is open to US residents only, ages 18 and above. It ends December 20 at 11:59pm EST. To enter, please use the GiveawayTools form below. Good luck!